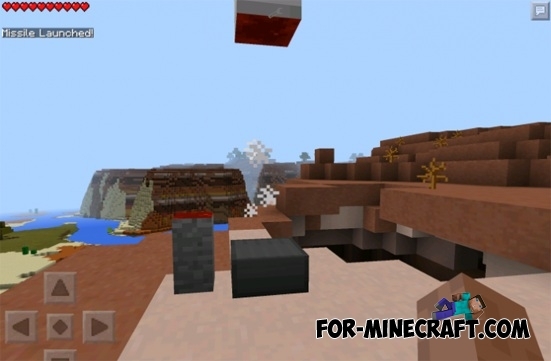 You will be able to create 5 types of new combat missiles in Minecraft PE 0.11.1! So, you will significantly increase the attack power of your character, and can simultaneously attack multiple creatures. You must be extremely careful when using weapons of mass destruction! Each missile will fly in different ways, and create the explosions of all sizes. These combat missiles have excellent accuracy and always hit the target! You need a basic missile platform that must be placed on the ground (Missile Platform Maker ID: 501). Now you have to put a missile. Now you need to define two positions for indicating the flight path. Tap on the platform (this will be the first position - the starting point), and then click on the block - is the target. In this case, we set the target for a small house. We just clicked on one of the blocks, of which it is made. Need to go back to the platform with a missile. Press the red starter button. Thus, you have completed the launch! The target is destroyed! What will happen with mobs?